Hello! So why is this a challenge? Mainly because of the shaders involved in the scene. Optional The small paper napkin on the left and Themetallic spoon. And finally because it is difficult to trick our senses. Thefinal image should represent a tasty good gelato. No dry, no odd, not too fake. Quite curious to see it also a benchmark for GPU vs CPU Spreadand share ! of this thread, please credit Giorgio Luciano and Eyadorabi. Use any 3d software and techniques you would like. is it challenge no LC#48? Hey all! Cool challenge! That’s my first iteration. still working on light and materials but all constructive C&C are very welcome. @mindatlarge : That’s really awsome work. 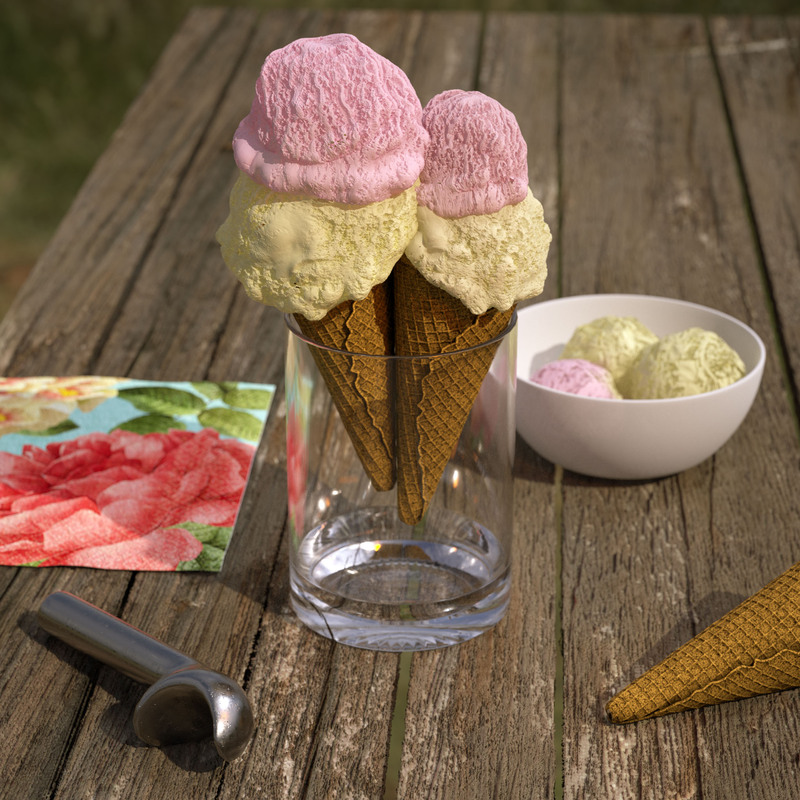 Love the ice cream shading. Did you use displacement on them? Here’s my last versiont (I think). @neonbulbs : thanks, yeah it’s just displacement and a mix of glossy and sss material. 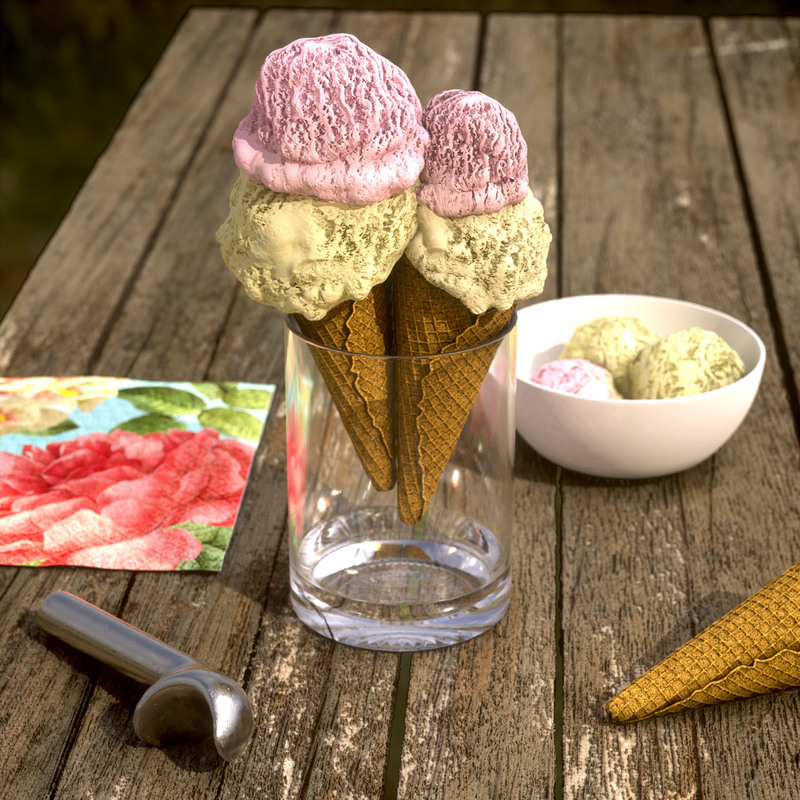 I used Redshift and got a 40min rende at 4096*4096px, one HDR, two areaLight, Dof, SSS, displace. I’m still noob with RS, I will test it more if I have the time. First of all thanks for sharing such a great entry. @mindatlarge I relally love your entry. 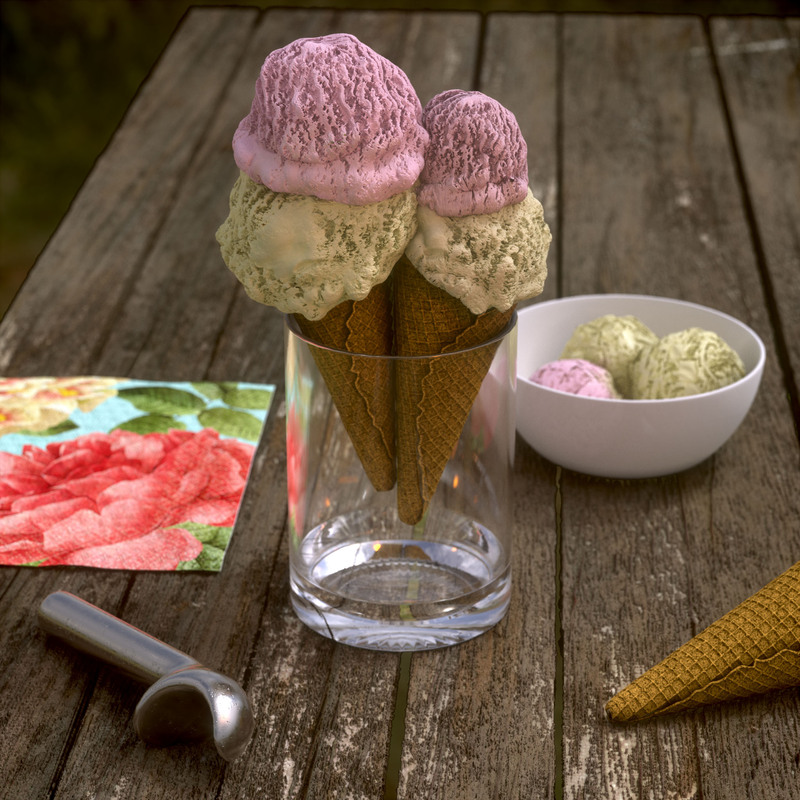 Shaders looks great, the gelato balls have a fantastic displacement (is that displacement map ?) and also the bases looks great( I will make them a bit darker). The metallic scoop looks perfect (reflections + textures) and also the dirt in the glass. (feedback for version one written before seing the second entry) If I see correctly the principal light is coming from the right (looking at the direction of the shadow from the glass and scoop) It will be interesting to see a bit more contrast and how the caustics in the glass will look boosting a bit the overall lighting. What are the spec of your system ? How much does it take to render ? If you send me via pm a bigger render I will be very glad to have it print. Great work ! @Fed. The gelato really look better now, I will make the bases just a bit darker. Also I like a lot the ceramic material. It seem you still have to change shaders for the scoop. A bit more contrast in he light would increase “reading” clarity in the image. Overall it is really a great entry. I’ve tweeted and reposted on my facebook the thread which has really great entries !! Pls do the same. Sorry for my late feedback ! I thought that I would try this challenge out. I am overall not very happy with the way my shaders turned out in terms of glossiness, especially compared to what others have posted here (nice work! ), but I am pretty happy with the displacement. Three different versions. The first is directly out of Octane, the second and third are after I did a little compositing in Nuke to get better AO. Suggestions welcome. Thanks for the critique! I was overall not happy with the project. I tried to get the depth I wanted using subsurface scattering on a mix material in Octane and I don’t think it was successful. As you noted, it looks a bit weird. My lighting setup it a simple sky and an environment map in Octane, but I did add one area light to warm things up. I’ll pull this one out of the dust bin and try another version, pushing the light and reworking the shaders!